Play off chasers Woking couldn’t beat relegation struggler’s Welling in front of a 2,800 strong crowd but the Cards went away with a point after Scott Rendell and Yemi Odubade scored in an entertaining contest at Kingfield. The draw now sees Woking move into 5th position, after Forest Green Rovers dropped points against Aldershot on Good Friday, giving Woking a great opportunity (Come Monday) for Gary Hill and his men to make the advantage count by winning, but Welling gave it their all as they wanted the points just as much as Woking did. Going into the game Welling were certainly a bogey team for Woking, which suggests why Woking have only beaten them once in their last five meetings and the impressive start Woking made in the game was quickly forgotten because it wasn’t long when Welling went into the lead. Former Cards striker Ross Lafaytte was quickest to react from a well taken set piece, heading the ball into the corner of the net. Shortly after Woking went into the lead themselves after a well worked bit of skill from Rendell, who could have taken the shot on himself, but he played the ball into the path of Odubade who calmly fired his shot into the bottom left hand corner, sending the 2,800 crowd into a roar. However, it was Woking’s defending that once again let themselves down after substitute Tashan Adeyinka drifted unmarked into the box and headed home an equaliser, restoring Welling’s slim hope of a relegation survival. A late Woking surge and a disallowed goal wasn’t enough to break Welling as the referee blew his whistle. Woking manager Gary Hill expressed after the game that this draw was still a positive result. He said, “I don’t know how I feel. I think deep down it’s a positive result. You see yesterday’s results and today’s results and we have gained another point advantage really on Forest Green and have made it harder for Eastleigh and gained a point advantage on them, but then you look at it in another way and you’re disappointed because you’ve drawn. “If we had won today and Forest Green and Eastleigh had won it would have been another game gone and you’re running out of time, so it’s given us a little bit more. 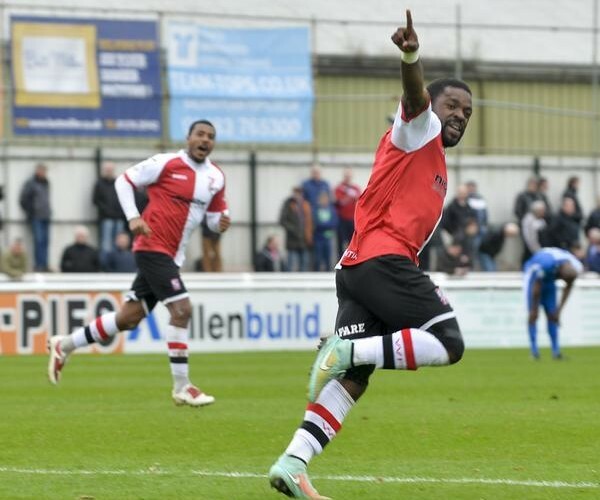 Woking are back in action on Monday as they take on Dover in what will feel like another cup final.